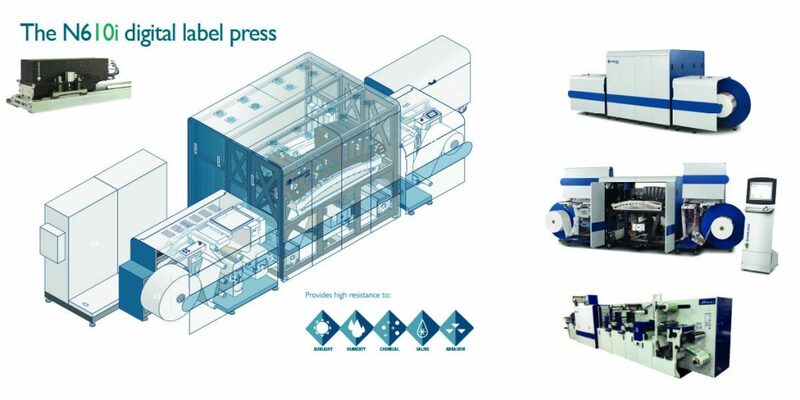 The Domino N610i is the only label press that combines the productivity of flexo printing with the flexibility offered by rapid job change digital technology. Its range of impressive features include industry standard 333mm (13”) print width, up to 7 colours (including opaque white), 600dpi ‘native’ print resolution and operating speeds of up to 75m/min (246ft/min). As an example of how it could lead to greater sales growth and increased profitability for your business, the N610i can produce up to 2,250m of product in the same time to perform a 30 minute flexo make-ready. The Domino N610i capacity can produce 3,000m (9,900ft) per hour at 50m/min (165ft/min). Our label press uses vibrant UV curable inks and is the only UV digital ink jet system capable of printing shrink sleeve applications. Imaging width 13.11”; media width up to 13.4″. The jumbo unwind system with automatic lift gives ease of use to the operator to get rolls of stock quickly on and off the press…up to 39″ diameter rolls of stock. You’ll need fewer roll changes, maximizing efficiency. There’s an option for in-line finishing as well. Kyocera printheads – faster than other inkjet piezo printheads.